Development of an area for the construction of an integrated food and farm produce wholesale hub, comprising: a fruit and vegetable market with three wholesale pavilion, a producers’ pavilion, a flower and plant nursery pavilion, a fish and meat market, a general groceries pavilion. The market is designed as a single structure, with central loading/unloading ports for each wholesaler/producer, centralized services and platforms for bulk purchasers. All goods movements take place under the same roof thanks to a three-point star layout. At the centre of the star layout is a hub occupied by the goods lots, with loading and unloading ports extending outwards along the arms of the star. – 8,200 sqm for the general groceries market. 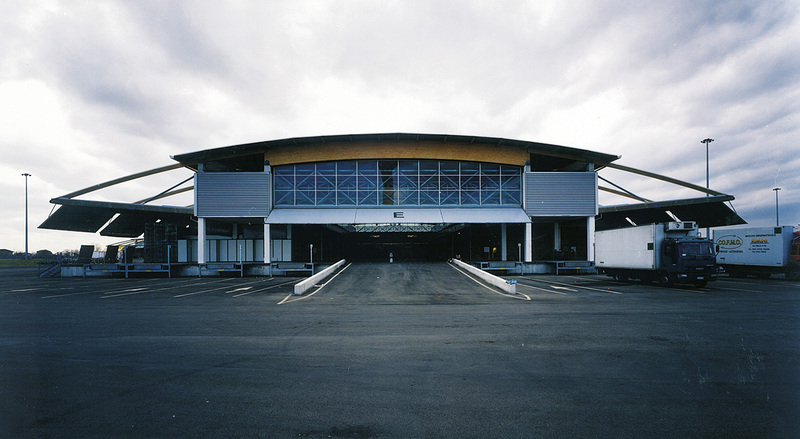 The design choices and planning objectives embodied in the development were geared towards optimizing the operation of the facility: spacious pavilions which can be extended to accommodate expansion, separate entrances for buyers and sellers, all goods movements under the same roof, and goods loading/unloading docks.